Form appears to have returned to South East London, with maximum points and two clean sheets from as many games it appears as though Charlton can look forward and forget about the poor run of form in October (which can happen to any team) – Football League action though can now take a break until the 24th as Cup duties now take over, first up is the historic FA Cup and a trip to League Two; Mansfield Town awaits, time to see if the Giant Killers are out in force this weekend. Of course there may well be a giant killing in Nottinghamshire this Sunday… For League Cup earlier in the season; Lee Bowyer would nail his intentions to the mast by fielding a weakened team against MK Dons and may well do the same this weekend – On a positive spin though, the Stag have never beaten the Addicks, these two sides meet for just the fourth time (two of those encounters coming in the old Second Division) with Mansfield only managing a 2-2 draw at best. In recent years though Mansfield have been one of the major forces in League Two and if promotion continues to evade the Addicks then these meetings may well become more often – Currently occupying the last of the Play-Off places; the Stags have lost just the one league game this season (at home to Exeter City) so regardless of the team we put out, victory wont be assured regardless!! As match previewer I’ve been looking forward to saying this for a while yet it finally appears as though Billy Clarke is fit to participate in First Team affairs; the Republic of Ireland playmaker having been out of action for a year has slowly returned with minutes for the U23s and should at least be on the bench for the FA Cup clash. Yet as one player returns two more depart for the Physios room – Luck has well and truly deserted Charlton players on the injury front of late with Igor Vetokele and Josh Cullen both now out for a number of months with a dislocated shoulder each… One final positive piece of news is the fact that German Centre-Back: Patrick Bauer is close to a return and is expected to make an appearance on Tuesday night against Swansea City in the Football League Trophy. Trying to predict how we’ll do in a Cup competition is harder than the League, quickly simply because you’re never sure of how much a priority it is in the eyes of the Management – If the League Cup encounter against MK Dons is anything to go by then you’d expect a quick exit; on the other hand Stevenage proved that there is an opportunity for others to get some game time, especially with the busy festive season fast approaching!! Are we ever going to try Dijksteel in CM, supposed to be his preferred position and what he played in the academy. Would be nice to test him out and see how he gets on. Away win 1-2 , possible shock but have a feeling we will win as we have very few proper games so we might actually take it a bit more serious. can we just please make round 3 and then get either Spurs or West Ham away for the day out. if the team is the same as predicted by FA I predict an away win. looks a pretty good team to me though with little experience. 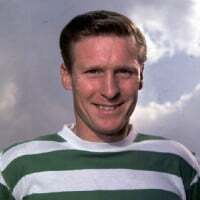 I've been supporting Charlton for 52 years and have never seen us win a cup. In flack the quarter finals of the FA cup and League cup is the furthest we have been in my lifetime. 2.1 Charlton and the march to Wembley begins. 2 - 1 Charlton , Ajose and Clarke on the score sheet. Only one result. Good luck in the next round The Stags! I would not underestimate Mansfield. I think it will be a close tie. 2-2 late equaliser for us. 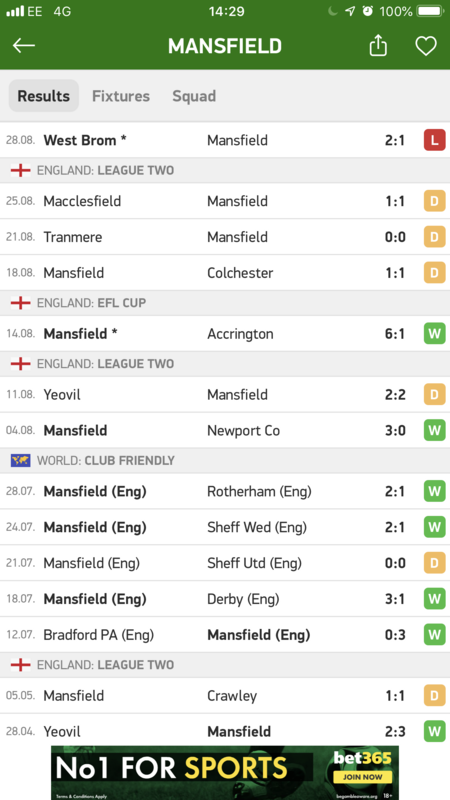 Just look at Mansfield’s record ( including pre season friendlies) since March . Quite phenomenal. For that reason I can see us getting beat . 2-1 Mansfield and another year when we capitulate in the Cup. No, no, no we do not want a replay. Either do the deed on the day or lose. 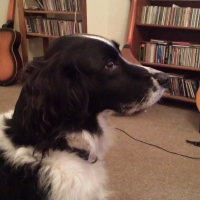 No too bothered either way. We must have one objective this year - staying up!! The lack of a league game for 2 weeks after this means that we'll probably play a stronger side than we might otherwise have put out. I don't see many "cloggers" in lower division football now, even many non league sides like to knock it about and build from the back. And when you look at our injuries, hardly any of them have come from bad tackles or dirty play. It's grim up north midlands. Can't see past a 5-0 defeat. Very excited for this one, been far too long since I've been able to catch one bus or train to a Charlton game. I think we will win but it won't be easy, I would say both teams to score is a bit of a banker. 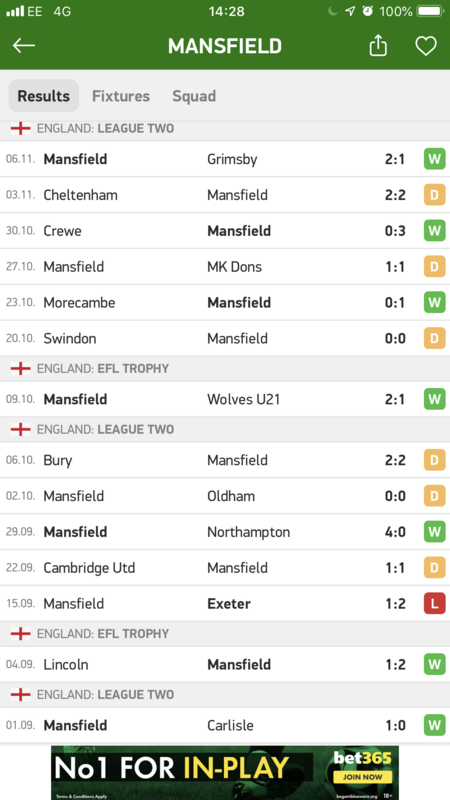 Mansfield have some good players, Tyler Walker, Otis Khan, CJ Hamilton, Danny Rose to name a few, all wouldn't look completely out of place playing for us. There is some down time to come. There are a lot of reasons why a cup run is a good thing. Around 480 Addicks have secured their place for the trip to Nottinghamshire and Mansfield have confirmed that they will be selling tickets on the afternoon of the game at the price of £17 per adult, £12 for concessions (over 65 and U18s) and £7 for under 11’s. Mansfield are only accepting cash on the day of the match.